The cumulative effect of not sleeping enough over the past few days was catching up with and I had fallen asleep very quickly last night. However, the script repeated itself and an hour later I was wide awake feeling unusually hot. In fact, so much so that I had to remove a few layers before trying to get back to sleep again. I also had a very itchy big toe which on closer inspection revealed the tell tale signs that a mosquito had taken a small bite out of me. Up until now I had experienced no creepy crawlies nor any pesky mosquitoes. I got up to go out to the rest room and on the way back stopped to enjoy the incredibly quiet surroundings of the temple grounds and a beautifully clear night sky full of hundreds of stars. The clear night sky was at least a positive sign that the following day would dawn bright and clear. My attempts to get any more sleep failed miserably and I finally got up at 04:30 and started getting my things together. An hour later it looked like I had everything back in it's place again so I selected a photograph and wrote out my osamefuda and pinned both to the wall by the door. There had been only one other osamefuda in the tsuyado and it belonged to a Roger from Barcelona and he had stayed there March 3rd. Before leaving the tsuyado and the temple altogether I walked over to the main hall and prayed. I then returned to the tsuyado, put on my pack, did one last check to make sure I had not left anything and then headed back out the main gate, turned, bowed and continued in the direction of the supermarket I had visited yesterday. The sky was really clear and tinged red on the eastern horizon. The weather at least looked like it would be sunny today even if at this early hour it was necessary to put on my gloves to avoid the early morning chill. It was just after 6 o'clock when I left and I very slowly headed away hoping the pain in my leg was not going to scupper my plans for getting to Uwajima Zenkonyado. My leg was still hurting a little but it felt better than yesterday and all I could hope for was that it didn't get worse during the day. Just after the supermarket I spotted a sign for a Sunkust convenience store and that meant my first coffee break. I had already eaten an onigiri back at the tsuyado so coffee was all I wanted. I could also see a Lawson a little further on but today it was going to be a Sunkust coffee to start my day. I wouldn't claim to have become the 100 yen convenience store coffee aficionado but Sunkust coffee did have a richer strong taste. After the coffee I finally felt ready to make a start. My first target was near the zenkonyado I had stopped at the first time I had done the pilgrimage and it was about 9km further on. With my leg still hurting a little and occasionally quite a lot I kept a slow but steady pace and just kept going. Along the way I stopped only once to greet another ohenro-san and the woman he had stopped to talk to. It was the same ohenro-san I had taken the short ferry trip towards Sekkeiji (#33) but he had been one of those quieter ohenro-san who always seemed to be walking with someone but never seemed to want to communicate too much with me. The woman seemed to be a local resident and from her garden she had a truly wonderful sea view. What was most interesting as I had neared where I met her and the ohenro-san was that I had passed from perfectly clear and sunny weather into a cold misty fog and then back out into perfectly clear and sunny weather again. By the woman's house it was perfectly clear but looking out across the sea I could see a huge bank of fog stretching out across the sea and covering the mountain range further inland. I commented to the woman that the fog looked really interesting and she agreed, adding that it was rare phenomena. I didn't stop very long and before leaving I fished out a photograph of some plum blossoms and gave it to the woman. She seemed to like it very much. The ohenro-san who I assumed I had already given a photograph to put out his hand requesting one too so I gave him one and then continued steadily all the way to Uchimi Village. I stopped in a large fully covered bus stop with a long bench and took my first break of the day. It had turned into a very nice morning. The temperatures were still a little chilly but the gloves had come off and the the extra jacket was no longer necessary either. I took off my boots for a while, ate a dorayaki, drank a little cold tea and took 2 pain killers to try and dull the pain in my leg. After a 20 minute break I got going again. After passing through the Uchimi Tunnel the next stop point I was thinking about was Sunokawa Onsen. Yesterday had been a relatively light day and I had not yet reached the point where I smelled like a fermented fish but I liked that warm relaxed feeling you got after using the onsen and I was thinking of stopping for a quick dip. I also wanted to see if the warm waters might miraculously help my leg heal up too. When I got close to Sunokawa Onsen I discovered the same situation that I had found when I got to Ipponmatsu Onsen yesterday - it didn't open until 11 o'clock. I continued on to the small shop, got a hot snack and an energy drink and took another short break. The temperature had definitely climbed again so I removed my light fleece and was now down to a short sleeve sports shirt and my white ohenro jacket. After getting back out on the road again I kept up a gentle steady pace for the next 2 hours only stopping a few times along the way to give photographs to people. It seemed that today I was playing the osettai giving role more than the osettai receiving role. The first was to a woman assisting a road repair crew. She was positioned a few hundred meters before the place where the road repairs were being made and her job was to hold up a flag which instructed approaching traffic to slow down. I stopped beside her and without interrupting her work too much I handed her a photograph and continued on my way. After taking a very quick water break in a very pretty port side area I continued on again. A fruit seller from across the road called out and held up a mikan. I crossed over and he was busy gathering together several but I told him one would be enough. I got out a photograph for him and walked away with two mikan. A little further on I met an old lady pushing her trolley seat and even before I reached her I had fished out a photograph and when I got closer I just greeted her, gave her the photograph and continued on my way. It was a very quiet sort of day in terms of meeting people along the way so it seemed nice to give out photographs to the few contacts I did come across. I noticed that the ohenro-san who I had met talking to the lady a few hours earlier approaching from behind. He was with another ohenro-san who seemed to be dressed in standard clothes but had the Japanese version of the ohenro guide book in his hand. I continued on ahead of them and after crossing through the Arashisaka Tunnel decided to take what I expected would be my only extended break for the day. It was almost midday and if my calculations were correct I had covered about 20km of the 40km I needed to walk. Just after the Arashisaka Tunnel I found 3 different huts situated around a small fish pond. I found a bench where I could enjoy the warmth of the sunshine. I took off my boots, rolled up my trousers and ate a few of my snacks. As I was resting the other ohenro-san who had been walking a little way behind came and sat on the bench next to mine and the ohenro-san who didn't look like an ohenro-san continued on his way. As I sat there a woman suddenly appeared with the paraphernalia for 2 cups of instant coffee together with a flask of hot water. She poured some of the hot water into a paper cup and handed me the instant coffee, milk, sugar and plastic spoon and did the same for the other ohenro-san. From the conversation she had with the other ohenro-san she was a sightseeing tourist just travelling through the area. Before she could get away I gave her photograph of Mt. Fuji. This was the only long break I took and after 25 minutes I was on my way again and the next target was going to be Matsuo Tunnel which I remembered was very long but after that I knew central Uwajima was not too far away. I had stuck to Route 56 since early morning but the scenery had changed constantly between sea views, views of open agricultural fields and sometimes small villages. I stopped at a Circle K convenience store to use the rest room and left the store with an ice cream in my hand plus one less photograph which I gave to the shop staff. 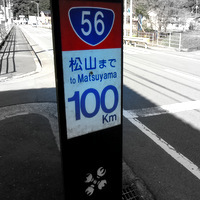 I was making slow steady progress and a few hours later I approached the start of the Matsuo Tunnel. Just before I got to the Matsuo Tunnel I spotted an old man and a couple of young care workers who were with him coming towards me. When they got close to me I held out a photograph for the old man but it seemed to confuse him so one of the care workers took it and thanked me in English. 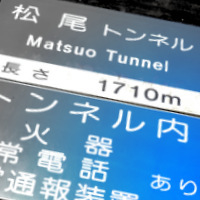 Arriving at the mouth of the Matsuo Tunnel I looked at the tunnel specifications on a plaque close by and discovered it was 1710m long, just a bit longer than the Shin-izuta Tunnel (1620m) before Drive-in Suisha. Traffic was not particularly heavy but there was a steady trickle of cars and trucks passing through. The only good news about being in a tunnel almost 2km long was that it was cooler inside than outside the tunnel. 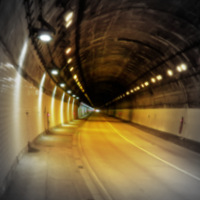 The temperature seemed unusually high compared to the past few days and it had turned into a very warm day so as strange as it seemed I was glad to get a bit of a break by being in the tunnel. It took me 22 minutes to make my way through the tunnel. Once through the tunnel I emerged into Uwajima proper and the first thing I noticed was a car showroom selling super cars of the Ferrari and Lamborghini kind. A bit further on an old man working in his field greeted me from across the road with a smile and a wave. I waved back and continued walking but then decided to wait for a break in the traffic before crossing over to his side of the road, walking back towards him and giving him a photograph. I had definitely been giving out a lot more photographs than I had imagined I would but it just seemed like a nice thing to do. Up ahead I saw a Lawson so I stopped to check my guide book and see exactly where I was in relation to how far I still had to go. In my guide book I found the Matsuo Tunnel, the Lawson and a Joyful restaurant and it looked like I was not too far from my destination. I flicked over the page of my guide book and slotted it back into the zip lock plastic bag. What I didn't realise was that there was another Lawson and Joyful restaurant combination marked on the following page and the gap between the first pairing and the second was about 3km. My reference point had mistakenly jumped to the second pairing, placing me about 3km ahead of where I actually was. Naturally the map directions no longer made any sense to me and I just couldn't figure out why it was taking me much longer than I had expected. All I could do was follow the stickers and as I continued on I started to recognize places I had seen during my first pilgrimage and then finally realised exactly where I was in relation to the guide book. The slight frustration of not knowing why I had not been making better progress was tempered by the sight of elementary school children making their way home. Some would stop to greet me and wish me luck with one particularly playful boy wanting to high five which, given that he came up just above my waist was more a low five for me and a high five for him. As I neared Uwajima Castle everything was much clearer and I was following the arrows and markers perfectly in accordance to what I was seeing in my guidebook. The owner of Uwajima Zenkonyado had told me he would meet me at the house at 18:30 so I had some time to kill. What I really wanted to do was find a hot spa or bath house but there was none marked in the guidebook so I just headed towards Uwajima Station in the hope of finding some place to sit or to do something. In the end I just headed into the station and sat in the waiting area. I'd avoided the center of Kochi City and for the first time in a very long time I felt I was back in an urban area again. Seeing a steady stream of weary looking office workers reminded me of the thousands of weary looking office workers I always saw back in Tokyo. It was interesting how my surroundings seemed to affect what I thought about and how it made me feel about the pilgrimage. What it made me think about was the everyday reality that existed beyond the pilgrimage and it was not a reality I wanted to think about too much just yet. A more pressing issue for now was that my leg was starting to hurt again and it seemed to hurt more when I was not walking than when I was walking. It was coming up to 6 o'clock so I headed back towards Uwajima Zenkonyado and the owner arrived precisely on time, greeted me and showed me inside. I wasn't sure if I did smell like a fermented fish or not but I apologised and asked if there was a bath house in the area. He said there was one a very short walk away and offered to drop me off a little later. The house was really great and Jun the owner later told me that he didn't want to publicize the fact that he managed a zenkonyado too much and wanted to keep a low profile. We spent the next 2 hours just chatting about ohenro, his own experiences of ohenro, meditation, his interest in Buddhism, his views on the sorts of things that can happen when individuals like him open a zenkonyado and much more. What he said about setting up a zenkonyado turned out to be a very interesting and thought provoking conversation. Outwardly, setting up a zenkonyado could be interpreted as a very altruistic form of osettai because it helped the walking pilgrims but he said that it could lead to unintended consequences for other people and also for the person who set up the zenkonyado. If a zenkonyado became really popular it could lead to a loss of income for commercial operators. It could also lead to resentment and over time to the closure of one or more of the commercial places. On top of this, for the zenkonyado owner, what started out as a relatively simple activity could turn into a much more arduous task of looking after a steady stream of pilgrims which may not have been the intention in the first place. The idea that doing something that was outwardly good and done with good intent, could nevertheless result in unintended negative consequences was very interesting. I listened carefully and didn't really say too much but I certainly began to understand how different zenkonyado owners were thinking about what they were doing. Hagimori-san had been the first one to talk about how some zenkonyado impacted local businesses and how this was not always a good thing. He had spoken completely in Japanese and was extremely passionate about the matter whereas Jun had spoken mostly in English and in a quieter more considered way. Both had very fair points to make. As a walking pilgrim, I had only thought of the positives but after listening to Jun, it was true that even things done with best of intentions could lead to problems. Jun left just before 9 o'clock after explaining where everything was and how to use what I may need to use. He had offered to drop me of at the public bath but said it was probably too late and said I could just use the shower at the house. He also very kindly suggested that I could stay a further day if my leg continued to hurt and to make use of the cold gel packs that were in the freezer. Staying another day given the condition my leg was in was actually something I really wanted to do but it was not something I would have asked him myself. I thanked him for everything and told him I would make up my mind about whether to stay another day to the following morning. It had been one of those special kind of ohenro days for me because of lots of small but significant little things. I had spent virtually the whole day alone but had come into contact with many people. I had thought about serious things as well as all kinds of silliness that occasionally left me laughing out loud to myself. The sea fog during the early morning was quite surreal. The beautiful blue waters. The sighting of so many pretty butterflies. All these seemingly simple little things kept me in good spirits and to top it all, I had found a warm and hospitable place in Uwajima Zenkonyado. It was almost 11 o'clock when I finally got into my very comfortable futon. I tried to update my notes but sleep seemed to have the upper hand today and I was probably in dreamland as soon as my head touched the pillow.